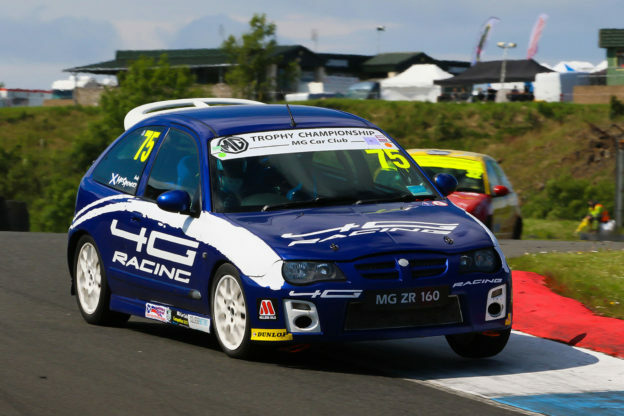 If you’ve ever wondered how you can get to drive competitively at some of the great motor racing venues around Britain, here is your answer – sprints and hill climbs. For a comparatively small outlay you can drive as fast as you like around some great tracks and up famous hills. You don’t need a particularly fancy car and if you own an MG you have easy access to well-organised and fun Championships. This article aims to de-mystify what you need to do in order to compete. I would strongly recommend that you first attend a couple of events as a spectator or even a marshal. Marshals get to stand near the track and watch up to 400 attempts at a given corner – a great way to learn the quick lines! This will give you a much better idea of the sort of things you need and what you will be asked to do. Nothing beats seeing the action and talking to the drivers. I will explain here the step by step guide as to what you need and give some pointers as to where to get it. Firstly, a sprint is a timed run around a track. Only one car starts at a time (though there may be two cars on different parts of the circuit at once). You compete only against the clock. Competitors are grouped together in classes and there are prizes for winners of each class depending on the number of entrants. A hill climb is basically the same but takes place on a (usually) narrower track and up a hill. The first thing you need is a Motor Sport Association (MSA) licence. These come in a wide variety of forms, from rank amateur (you) to international super star. Your licence will cost £27.00 and you need a minimum of a “Non-race Class B” licence which is the lowest grade you can get (and therefore the cheapest). You don’t need to worry about doctor’s declarations or any training, just fill in the forms and they’ll send it to you in the post. You can contact the MSA on 01753 681736 or You can download a license application form and application form completion notes from the MSA website. With your licence you will receive a thick rule book (called the “Blue Book”) and four issues of the MSA own motor sport magazine. The Blue Book lays down every rule associated with all forms of motor sport but thankfully you won’t have to comply with very much of it! I’ll highlight here what you do need to take note of but it is worth reading through as much of the relevant stuff as you can. One word of warning however: MSA licences run from January 1st till the end of the year. If you apply in August you will pay the full amount but you will have to renew in January. You will need to join a Championship in order to get information about what events are coming up and how to enter them. For MG drivers the obvious choice is the Luffield International Speed Championship. This is split into a Northern and Southern series. The Championship organiser keeps you informed as to your Championship position, results from events and sends you the regulations for each forthcoming event. Once you receive the regs, it is best to send these off as soon as possible as many events are heavily over subscribed. Each event will cost you about £70-80. There are two pieces of personal safety equipment that you must have: a crash helmet and a flame proof suit. As usual, there are differing levels of equipment and the level necessary for this grade of motor sport is the lowest. The flame proof suit can be single layer Nomex, Proban or similar (full race suits must be triple layered). Helmets must conform to certain British Standards and should display the correct sticker and should fit properly. Although you can get a satisfactory race suit for around £70, they don’t look as nice as the ones the F1 guys wear! Nicer suits are available and if you have aspirations to race, you will want a triple layer suit for that. Fire proof boots and gloves, while not obligatory, are also recommended and a balaclava is another option. If you are running an open car, you will need a helmet with a visor or goggles. If you are buying an open face helmet check whether an approved visor can be fitted as an accessory. For most speed events, timing is performed by a light beam system. To standardise how cars cut the beam, the Blue Book lays down rules for a timing strut to be fitted to each car. This is basically just a rectangular bit of metal (or card) that affixes temporarily to the front of the car. You can work out all sorts of complicated methods to secure it, but often double sided tape is sufficient. I’m able to use one of the screws that hold my number plate. This is listed as optional in the Blue Book (Rule L 10.11.3) but the MGCC Luffield Speed Championship rules specify that you must have it. You need at least a 1.5kg fire extinguisher firmly secured to the car. These cost around £45 and you may have to get a 1.75kg model. It is easy to screw this to the floor somewhere in the passenger compartment and it can be left in for normal road use. Just before each event you enter, you will be sent details of your entry number. This number must be displayed on your car. The MSA rules stipulate a black number on a white background, but for the purposes of speed events, contrasting numbers (say a white number on a red car) are fine. You can either make numbers up with masking tape (curved numbers are tricky), buy pre-cut numbers, or make up sets from magnetic plastic. 1. Yellow tape around the battery ground lead, supposedly so that it can be cut quickly in an emergency by marshals. 2. Ignition off switch marked. This is really a rule for the specialist cars which start and stop engines by elusive buttons on the dashboard. A sticker somewhere near your key on the steering column with an arrow pointing in the “off” direction should be sufficient. As none of these things are hard to fix on site, it is sometimes best to just listen to what the particular scrutineer wants, and then comply. If you don’t have the right sort of tape or tool, there is a very good chance that someone in the paddock will help you out! If you are planning to compete with a road car you will usually be eligible for an unmodified class. Each particular class has various restrictions on what you can and can’t do to the car in the way of modifications. These are generally set so that if you don’t want to modify your car, you won’t be at a disadvantage against people with more time and money to spend on tuning. The most basic thing you can usually do is to change the air filter but more expensive suspension or engine modifications are usually prohibited in the unmodified classes. You will need an MOT certificate if the car requires one but if you are planning to drive to events in your competition car, this should go without saying! If you are running on road legal tyres they should be fine for events. The Blue Book has a list of permitted tyres but you are unlikely to have anything so exotic on your car that you can’t use them at an event. There seems to be a lot of black magic associated with tyres. Sprint paddocks are full of people checking pressures, pumping up and letting down. I’ve not worked it all out but one day when I’m consistent enough at driving the same line, I may be able to make a judgement! You should have an accurate tyre pressure gauge (about £45 with range 0-40 lbs.) and a pump. It is not necessary to change your tyres to compete. If you are coming up to needing a new set of tyres, however, it might be worth asking around to see what others recommend for your car. You might be able to get a tyre with more grip (but a shorter life) than you would normally fit. Obviously the clutch and transmission are going to take a bit more pounding than in usual driving but you should remember that each event usually consists of up to 5 runs each lasting around 60 seconds or less. Extras – What you don’t need but might like! Many sign writers will make up vinyl signs that can either be stuck directly onto your car or put on magnetic backing. These aren’t very expensive and you might like to put your name (or your car’s name!) on your car when you’re competing. You might also see if you can come to an informal sponsor ship deal with a friendly company and swap car space for your entry fee perhaps. You are already signed up in one of the Championships so notification of an event was sent to you early. You read the regulations, filled in your form and sent off your payment. About a week before the event you received confirmation of your entry and were assigned a competition number. You were also told what order the competition would run in and what time it starts. Events are widely scattered and usually you are told of the nearest big town. Most organisers help you by providing a map or putting up signs to direct you to the event. You should get there with plenty of time of course! The event regulations should have contained instructions as to where to park. Some venues allocate numbered spaces for each competitor corresponding to their competition number, others allocate certain areas for each class while some just tell you which field to park in. Try to follow the rules and if in doubt, ask. Usually the first thing to do when you’ve arrived and parked is to go and sign on. For this you will need: Race license, Club membership card and anything else the regulations specifically ask for. If allowed you should definitely walk the course. There is usually a set time by which the course must be cleared so if you are running a little late you might want to skip signing on until after you’ve walked the course. If you’ve never been to a venue before, walking the course should help you avoid any really silly mistakes on the first practice. It should also enable you to push just a little bit from the very first run. I won’t pretend that it is easy to judge braking zones or traction when you are on foot, but I’m told that if you do it often enough, you get a good feel for these things. The other reason for walking (and the reason why all the most experienced competitors do it no matter how many times they’ve been to a particular venue) is that you can find out the track conditions for the day. Before you can be scrutineered, you will need to spend some time putting on your timing strut. Race numbers should also be applied and any other signage you are running with should be in place. Before you have your car scrutineered, you may have to remove unnecessary items from the boot and passenger compartment. You won’t need your mobile phone on the run! Many competitors also remove their spare wheel and jack for weight saving reasons. You can usually find a small pile of bric-a-brac behind each car in the paddock. A small tarpaulin or ground sheet to cover your stuff might also be a good investment. Scrutineering is the check that must be performed on your car before it is declared fit to run. At your first event your helmet may have to have an MSA sticker applied to it which will be checked at subsequent events. Your overalls will be inspected as well. Then your car will be checked: timing strut, fire extinguisher, numbers, throttle linkage, tyres, wheel nuts and brakes. This is all done visually and if your car is road legal you shouldn’t have much to worry about. Some venues will check noise levels, but again most MOT worthy cars shouldn’t have any trouble. When the scrutineer is satisfied he will give you a sticker or card which will be checked at the start of your run. 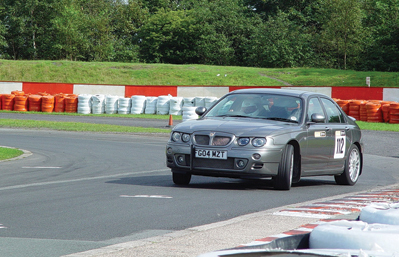 If the event is a sprint at a race circuit there may be a convoy lap in lieu of a walk round. This will consist of everybody snaking slowly round the circuit and back along the return road (if there is one). The idea is not only to get an idea of where the track goes, but also to familiarise yourself with marshal’s posts and other features. Most events run in class order. Some events are very strict and require all of the competitors to run strictly in numerical order too. When it is getting close to your turn you should start your engine and listen out for announcements. When called you should line up for the start. Once you’ve got to the front of the queue you will be lined up for the start. The exact procedure differs from venue to venue so listen to what the marshals tell you. Sometimes you will be held on the line by marshals or with a wheel chock. Most of the time marshals will want to roll your car up to the line by hand to get the positioning right. There will usually be a red light and when that changes to green a marshal will tell you to go in your own time. Don’t spend too long waiting after the light goes green but remember that the timing is from the moment when you move, not when the light changes. Sorry, but someone more experienced should write this bit! Suffice to say that if your car is precious and uninsured (your road policy will not cover this use) then the old maxim: “to finish first, first you have to finish” should apply. I also like to abide by the “brake early to avoid disappointment” rule, especially on the first practice run! Once you get back to the paddock you will be interested in your time. This will be displayed usually near the place where you signed on. It is a very good idea to look at other times in your class and get a feel for how well you are doing. Once you’ve done that you basically have all the time ’till your next run for socialising and chatting. 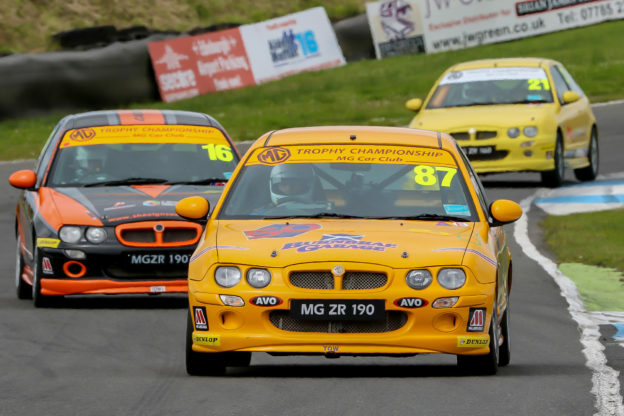 It’s really quite a sociable sport and there is a very good camaraderie amongst the MG drivers who take part. I’m reliably informed that if you do well you can sometimes win a prize! It is worth checking and not running off home if you have a hope of taking away something for the mantle piece! A few days or weeks after the event, the organisers usually send out a complete list of the results. The time this takes to happen varies widely from event to event. Some events don’t send out results, however, so you may want to ask the organisers and see if you can take some home at the end of the day. If you’re new to a track, don’t push it too far on the first run. Some of the hill climbs especially have very little run off area so mistakes can be costly. If you are nervous you might be best trying an event like Silverstone as your first where huge run off areas, designed to allow much faster cars than you to fall off the track without hitting anything, are a very nice feature! Finally, remember that the idea is to have FUN and with the Luffield Speed Championship, this is guaranteed! Originally Published in 1999 updated in 2006. 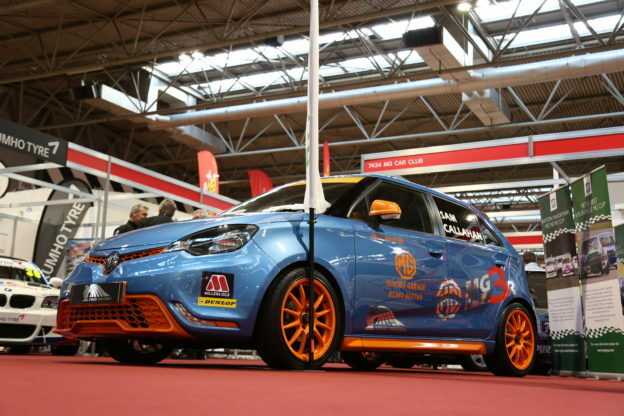 Visitors to the MG Car Club stand at the Autosport International Racing Car Show will be able to see Knight Industries’ new MG3 race car making its event debut. The MG Car Club’s MG Trophy has beaten the British Touring Car Championship to win the Downforce UK Saloon Car Series of the Year award for 2017. The MG Car Club is pleased to announce that it will be promoting its seven racing championships at the 2018 Autosport International Racing Car Show. 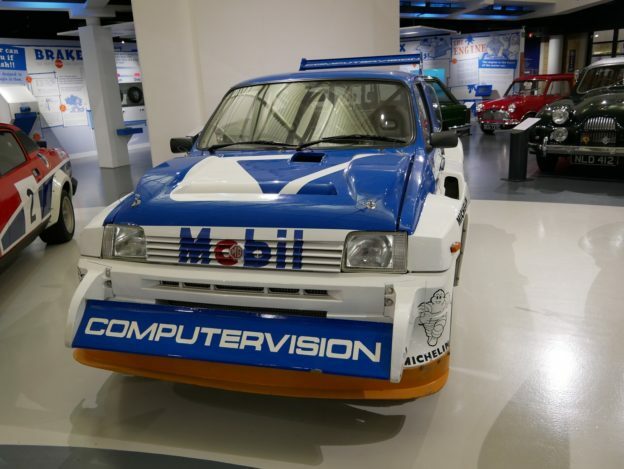 The MG Metro 6R4 is to play a starring role at the HRCR (Historic Rally Car Register) Open Day, which takes place at the British Motor Museum in Gaydon on January 13.